A great padded dog collar or harness and dog leash will give your dog a great look. Whether you own a German shepherd dog, Golden retriever, or even a toy dog, it will also provide a nice and comfortable fit that will not bother your canine companion. 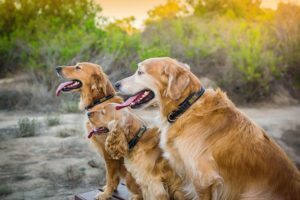 As a dog owner, the options that you can find when looking at such collars are rather varied and depend on the dog’s neck size so it helps to look at what is available. Fortunately, there is a great variety of such collars for you to look for. These collars are designed with plenty of reflective features and soft materials. They are fully padded for your canine companion to wear with ease while running or being active. Of course, the fact that these are not going to bother your dog’s skin certainly makes it easier for you to get your dog to feel comfortable. If anything, these comfy padded dog collars will be great for your dog to have when taking your friend out for a walk, what with them not being likely to be rough on the dog’s skin. 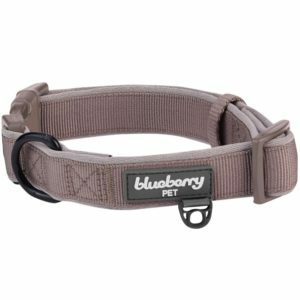 The first of the padded collars to find is this option from Blueberry Pet. It can be ordered in one of six colors and in two sizes. This is about an inch wide and offers a comfortable body that stretches well. The soft body of the collar also creates a comfortable feeling that is not too hard to use and offers a relaxed style. The padding is carefully secured with a series of strong faux leather materials. These are applied evenly all around the collar to create a great fit. This does not rub off on your dog’s skin. It should be perfect for use while walking your dog. This next choice is from Black Rhino and features a comfortable body with one of four different colors and in three sizes. This is made with a neoprene material that is solid and flexible. It keeps your dog from feeling irritated and yet it will not be at risk of wearing out or breaking apart as it is used. This also comes with a reflective coating. This allows the collar to be a little more visible without being too rough. The buckle on the side is also very easy to adjust and isn’t too rough or hard to handle. Neoprene is used in this collar to create a nice look. This adds an extra bit of padding to make for a nicer style. It comes with a nice nylon look with reinforced stitching to keep it strong and durable. 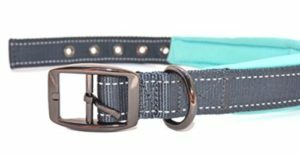 The snap buckle on the back part of the collar offers a good secure fit that is easy to add onto your dog’s collar. The black ring is also rust-proof and offers a comfortable tone that is not too rough to add. 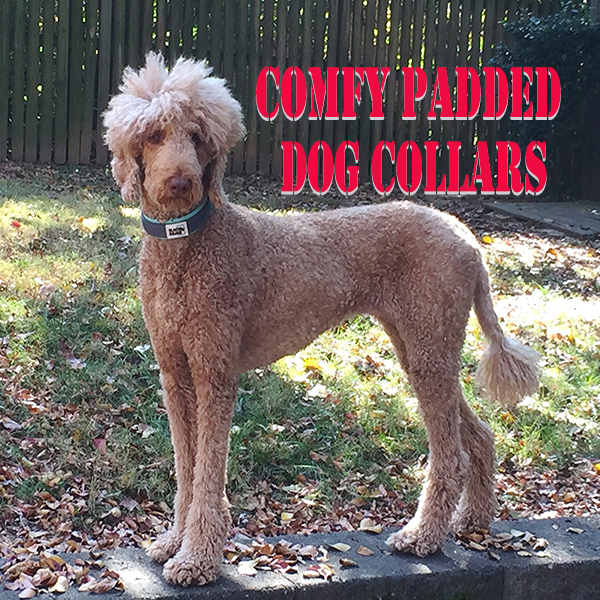 This is especially promoted as being calm and easy to fit onto a collar without any problems. 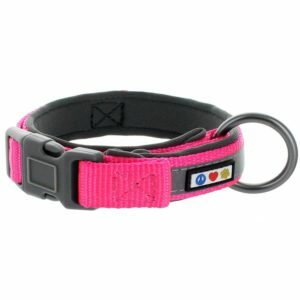 You can order this padded collar in one of a variety of colors. It features a dark black base with the edges coming in a vibrant color that adds a nice overall look to the collar. The lambskin padding on this is especially easy to wear. The hardware is made of either brass or stainless steel depending on the color. Either option offers a nice shine with a good glow that isn’t too unusual or gaudy in its appearance. The classic styling on this collar especially adds a classy look. 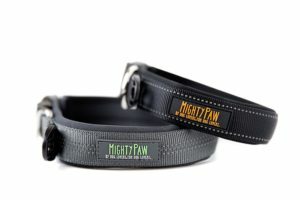 Another great choice to find, this Pawtitas collar is available in nine colors and five sizes. This is made from a single piece of nylon. It also has a reflective ribbon that is comfortable and creates a nice shine when used properly. This is also folded over in its arrangement. It has been fully reinforced to be stronger and will not tear apart easily. The black ring on this is also rust-proof and does well with hanging charms or other decorative items on its body. The reflective strip is particularly made with a mix of polyester and cotton. It reflects ambient light and makes it easier to notice in low light conditions. This can work well if you are in normally dark places with your dog. This particular model is made for cases where you bring your dog out with you on a good run. 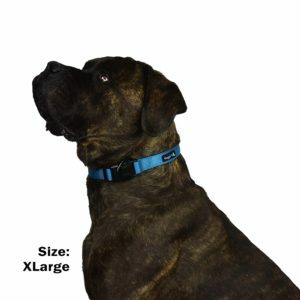 This is a soft collar that does not chafe your dog’s skin thanks to its neoprene padding. It offers added traction during high-speed activities like running. It can also handle a number of outdoor conditions including rainy situations. It will not warp or weaken with use. The reflective thread on the top and bottom parts of the collar feature a white tone that reflects light well. It is easy to see this whether your dog is wearing a black or gray collar. Watch for how the collar ties up. Anything that ties inward could be dangerous if not managed properly. This could come off quickly or even tighten if it is not used properly enough. Look at how well the collar can be fastened and secured. Make sure the collar isn’t overly tight or otherwise difficult to apply. Leave about two fingers of space between your dog’s skin and the collar when you stretch it out. This is important as some collars might not be as flexible as others. This is also a good distance to ensure that the collar will not be too tight. Many loops are designed to secure tags and other accents. You should not apply a leash onto any of these loops unless the collar you order actually requires it. Take a look at these comfy padded dog collars when finding something for your dog to wear. All of these are attractive and worth having.